Nigeria's central bank has ordered the country's banking sector to report suspicious cash transactions from people involved in politics. The move is part of sweeping reforms made by central bank governor to try and stop corruption. 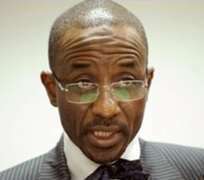 Mr Sanusi has sacked the heads of five banks top and brought fraud charges against several bank executives. The regulations are common elsewhere in the world since the 11 September 2001 terror attacks on the US. The regulations, published on the Central Bank of Nigeria (CBN) website, now require banks to report large movements of cash between accounts if one of them belongs to a "Politically Exposed Person". These are defined as former heads of state, politicians, local government chairmen, court officials, soldiers and members of royal families. Many "Politically Exposed People" are major shareholders or directors in Nigeria's banks. Under the regulations, the identity of anyone making a transaction above 250,000 naira ($1651, £1013) must be checked. The CBN has a list of "red flag" suspicious transactions that it says should trigger investigations. But a BBC reporter in Nigeria says the people behind corruption and money-laundering in Nigeria will already be working out ways around the regulations. In August, Mr Sanusi rescued five banks and fired their senior management, after they were found to have very low cash reserves. Four of the chief executives have now appeared in court charged with fraud. The country's Economic and Financial Crimes Commission (EFCC) says nearly $300m of bad debt has been recovered, but that billions are still outstanding. The reforms come as Mr Sanusi tries to find a permanent solution to Nigeria's banking crisis by selling them off to outside investors.